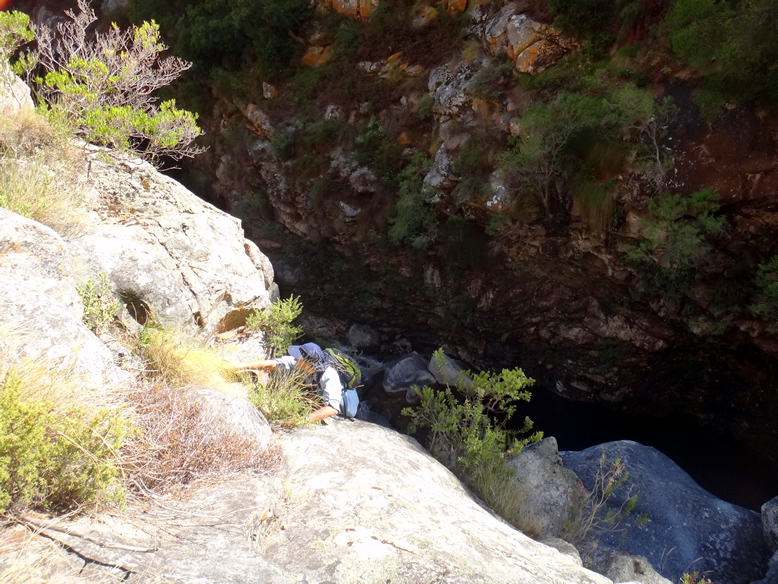 Not more than a 90 minute drive out of town lies a remote kloof, a canyon I suppose you might suggest. It is steep sided with a gradient to match, remote, rocky and unspoiled, unspoiled in a way that so few places really are. Through this little piece of paradise flows the most crystal clear water outside of an Evian processing plant, water with the transparency of London Dry Gin, and in that water, camouflaged by eons of natural selection hide trout. 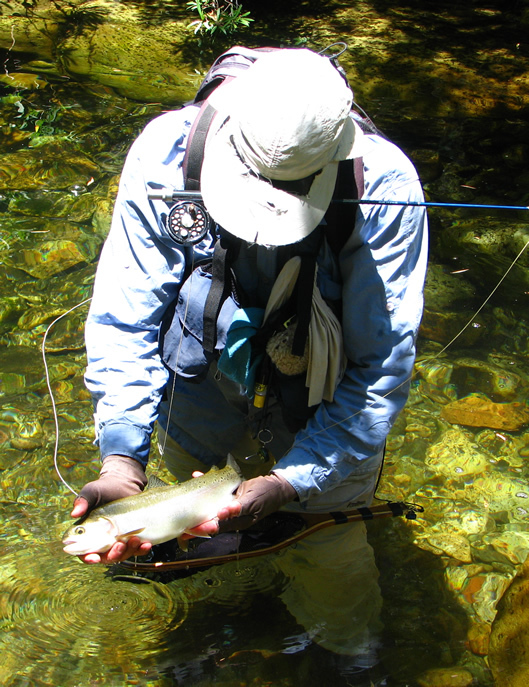 Glorious trout, pretty trout, near invisible trout, even some large trout, trout given of a green hue and pink side bar which can bring tears to the eyes of fishermen and artists alike. Trout of which dreams are made, fish that appear and disappear in ghostlike fashion as they hover over the boulders, trout that really make you wonder if God wasn’t an artist who just got a little carried away putting on the dots. Crystal Clear water and trout which are as pretty as hell. 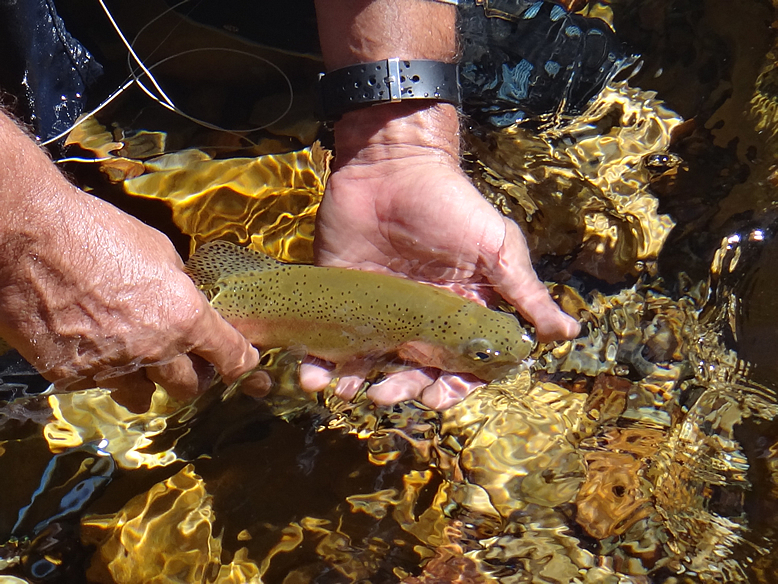 In fact some of the ancestors of those trout were carried into the canyon over twenty years back by myself and other anglers to re-stock a stream that was becoming seriously under populated. Manually portaged in as tiny fingerlings ensconced in highly oxygenated water, sealed in plastic bags and stuffed into back packs. 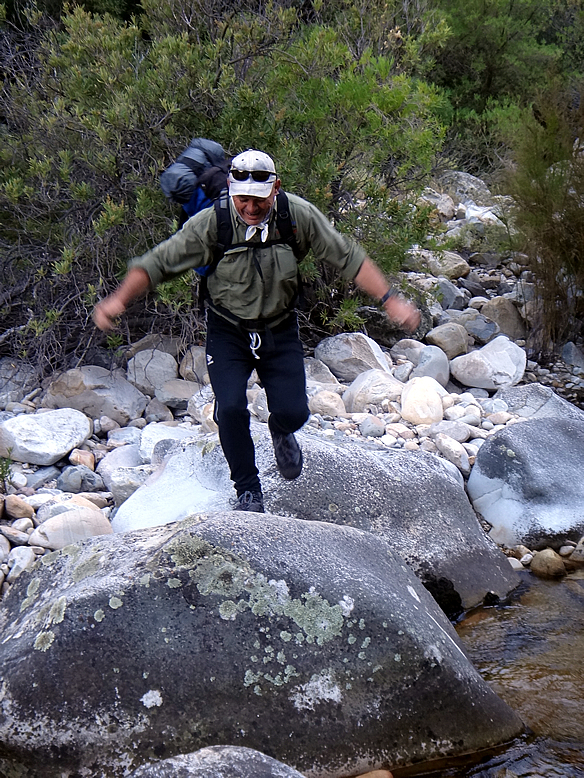 Carrying haversacks filled with swashing water and baby trout up a steep sided valley is something that would only be undertaken by the dedicated or insane, it was hard work and took the entire day. 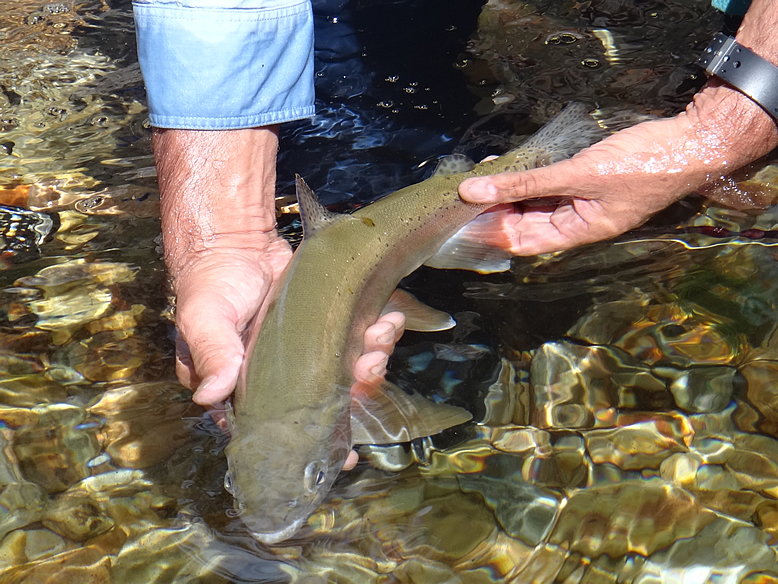 Stocking trout like this is analogous to planting a shade tree, you have no idea if you will ever reap the rewards of your labour but at least hope that others will benefit in the future, the ultimate example of “Paying it forward”. Over the intervening years myself and many others have reaped such benefit, the trout thrived for a while although numbers now seem to be somewhat diminished once again. The fish that remain however still manage to reproduce, perhaps more effectively some years than others, and whilst it can be hard fishing it still is wonderful fishing. A rare venue of genuinely remote aspect, difficult to reach and totally unspoiled by the excesses of the modern world. Too remote to be over utilized and too steep and rugged to offer any hope of commercial intervention, building, farming and such. The water continues to quietly erode the sandstone cliffs my microns each year as it has since the beginning of time and the fish lead relatively untroubled lives hidden away in the deepness of the natural world. The climb in to the remote sections isn’t for the faint of heart. That said the valley hasn’t been without its political troubles, at one time the powers that be changed the regulations in an ill-considered attempt to encourage the masses to embrace nature. Increased numbers were provided permits, a car park of sorts was built and bridges across the small streams that stand as sentinels to valley were manufactured. It quickly became apparent that such intervention threatened the wellbeing of the river, the paths became eroded, the car park washed away leaving a badly scared landscape. The bridges broke and the signboards that sang the praises of a natural world which they themselves sullied by their presence have been lost to the vagaries of winter weather. 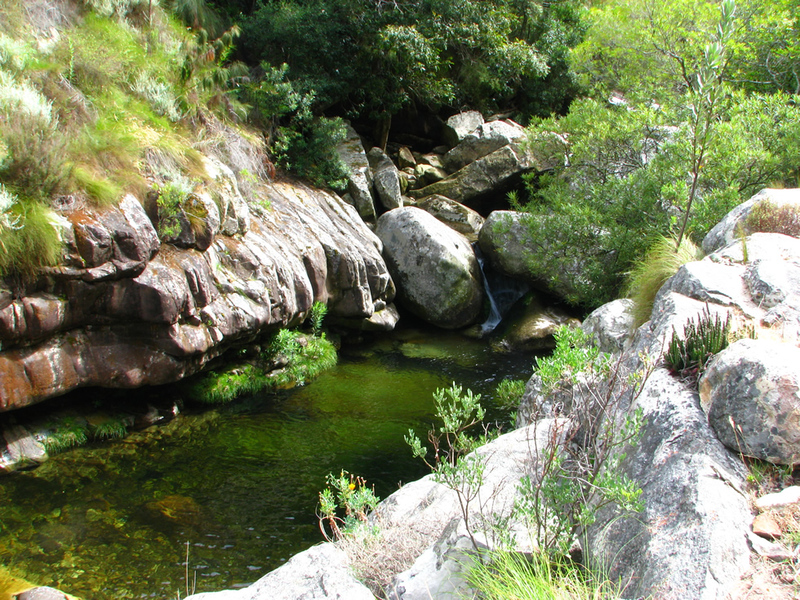 Quietly the kloof is returning to its natural state but the experiment led to its complete closure for a while and even now one can only gain access with a special permit issued by lotto once a year. That lottery offers little assurance that one will get to visit this special place and absolutely no control of when you may get the official nod to do so even if you are lucky. A spotted green ghost hovers in a pocket. So it was that this past weekend I had permission to enter the kloof, at a time when business commitments, workloads and all manner of other worldly interventions threatened my opportunity. In the end the only option other than to waste the chance was to make a rapid fire trip and we decided to hike in and fish high up the canyon, sleep rough overnight to avoid a potentially dangerous hike out in fading light and return to the car first thing in the morning. What keeps this valley in its pristine state as much as anything is the difficulty of access, the hike into the upper section were we would make camp is an hour and a half from the parking spot. 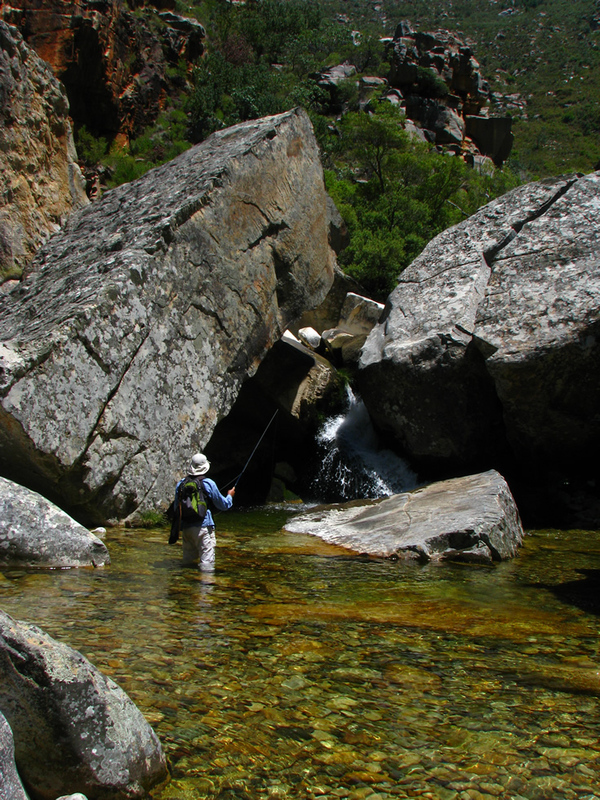 The fishing took us well up the river with an arduous 90 minute boulder hopping, rock jumping, cliff climbing and river wading trip back to camp. 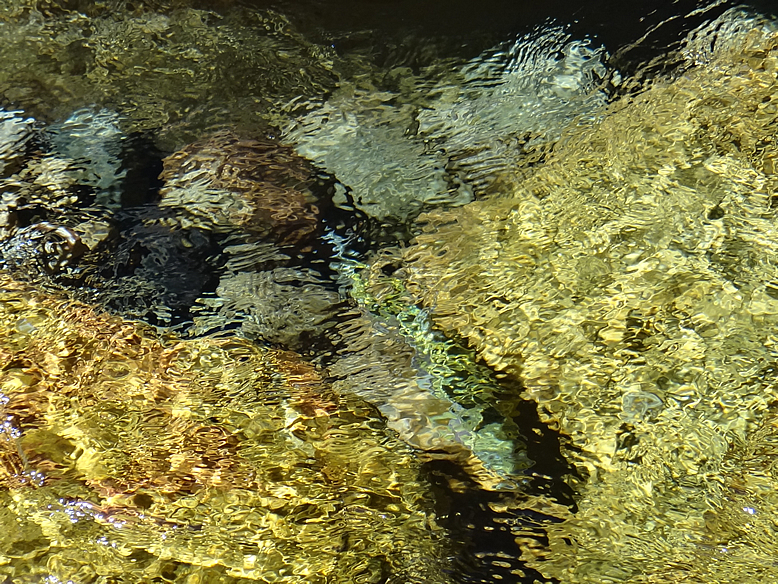 The river proved well worth the effort, we found fish, not perhaps a lot but then again more than enough, many hovering in small pockets of the crystal clear water, frequently only revealing their presence by the cast of their shadows on the stream bed. The low water made presentation tricky and we didn’t win all the competitions between angler and fish. Floating tippets on the calm water provided sufficient warning that was not all well to have the fish distain our efforts more than once but then again in some spots we prevailed. After hours of driving, hiking and climbing, Peter claims his reward. One particularly lovely and large fish taken by Peter on a small Goose Biot Parachute Caddis after we stalked the feeding trout for a few minutes, tracking it carefully as it disappeared in and out of areas of shade that mottled the surface of the pool. Trout pretty enough to bring a tear to your eye. The light was just beginning to fade when we turned tail and legged it down the river and back to camp, “tired but happy” as my mother would say. It had proven to be a spectacular day, with perfect conditions, virtually no wind and the water beginning to cool nicely as the evening temperatures dropped with the onset of autumn. Having slept rough we packed up at first light and followed the trail out arriving back at the car by 9.30am and ready for the drive back to the city. After a brief visit it was time to pack the bags and hike out. Even after a single night out in the bush town seemed hectic, traffic pushing and shoving, racing to the nearest shopping centre. People, oh my goodness there seemed to be so many people, all in a rush despite it being the weekend, all apparently too busy to consider the beauty of the remote places that lie all around them. Before we had reached the centre of town I was more than ready to turn tail and head back to the stream. 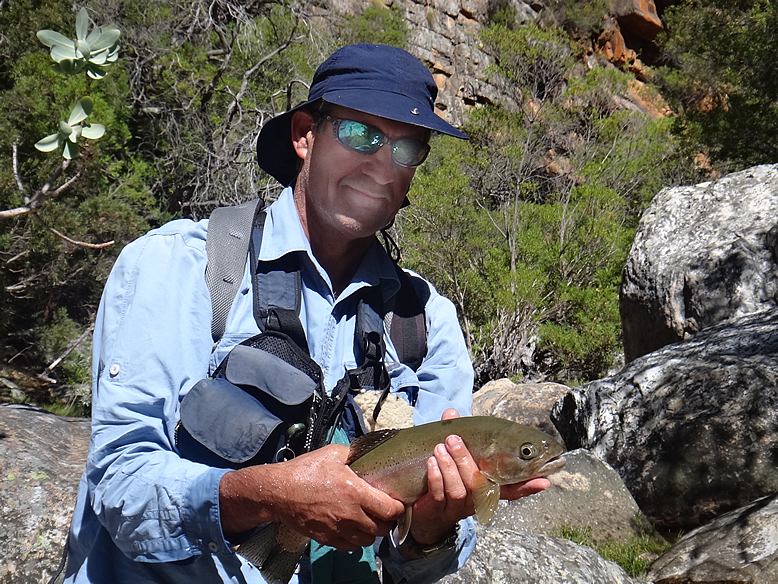 Back to some quiet solitude, glorious scenery and of course those trout. Who knows when I can go again? That quite literally is a crap shoot, but at least we made it this time and that is enough for now. 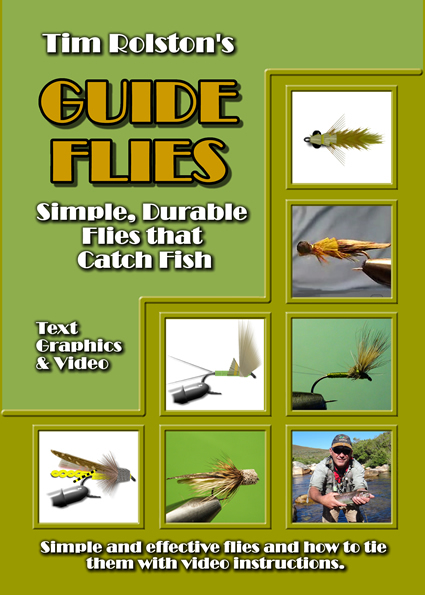 Newly released “Guide Flies” Simple, Durable Flies that Catch Fish: Now available in both eBook and Softcover formats.